We are planning to return to The Gambia in March 2019. While there, we will review how the libraries with whom we are working have developed during the past year and make future assistance plans. We shipped and the three libraries collectively received 350 new, age appropriate books in 2018. 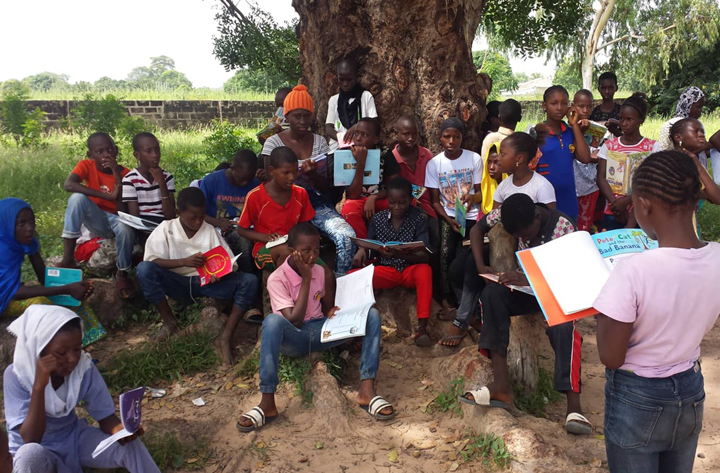 In Bakindick, we funded the building of a book case to protect their books since they are stored in an “open-air” classroom. In Soma we funded the installation of windows and fans since they already have a dedicated “open-air” building. We may add new projects to our roster. We will review a museum project in Kubuneh, a young adult community education project in Kiti, and a library project in Farato. We also plan to join the Kubuneh group in a soap making class as they work toward joining the Nema Kunku group in a soap making enterprise. Also, we shipped the groups in Nema Kunku and Bakindik another barrel of donated clothes, shoes, and small plastic household goods for resale. They use the profits to fund their other community projects. The Bakindik project got tablets to help them complete their administrative work. The unexpected $4,500 worth of textbooks for Latrikunda Sabiji Lower/Upper Basic School arrived in 2018 and we will visit the school again and 2 of the 18 students we sponsor who are having personal challenges. We look forward to cooperating with other groups including Bowie, Maryland based New Hope Academy- The Gambia, which has a program in Brusubi. To contribute children and young-adult clothing, gym shoes, cell phones, and laptops/tablets, email us now or click the Donate button to make a financial donation today. P.S. Now when you shop at smile.amazon.com, Amazon will give 0.5% of your purchase price to the Port of Harlem Gambian Education Partnership once you select us as your charity. Balal Library’s compound. A section of the library will be named for Ayuba Suleiman Diallo.